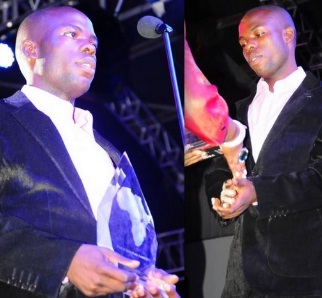 The 2011 PAM Awards New Artiste of the Year - Chris Evans can now attach a good price to his shows after launching his first album dubbed 'Mulungi' that filled Club Obligato to the brim leaving some revellers suffocating. The singer who shed tears after learning that Jose Chameleone was having his Valu Valu concert on the same day is so thankful to his fans especially the ladies who came in large numbers to grace his show. Several ladies were seen being carried out of Club Obligato after succumbing to the heat. Chris Evans hit the stage at 11:00pm clad in a gray suit performing songs like 'Ndikusasula Ki', 'Owekisa' and 'Mulungi' among others. The guest of honor was former Buganda Katikiro Mulwanyamuli Ssemwogerere who had a very good message for Chris Evans; "You are not a big artiste and you have a long way to go." Bobi Wine who was at the center stage of drumming up support for him was in attendance but did not perform. Afrigo Band, Mariam Ndagire, Haruna Mubiru, Ronald Mayinja were among the curtain raisers.